Solar power can offer Oregonians a range of benefits, such as long-term bill savings, resiliency and more green jobs. Despite recent growth in Oregon’s residential solar market, low- to moderate-income communities in Oregon still face significant barriers to accessing solar energy. Most low- to moderate-income households spend a higher percentage of income on energy costs than their higher-income peers and have less access to solutions like solar that can reduce their bills. More significantly, lower-income households and the organizations that serve them face a host of competing priorities on a day-to-day basis to meet their basic needs. As part of a long-term effort to increase solar opportunities for low- and moderate-income Oregonians with support from Oregon Department of Energy, Energy Trust sponsored a series of four Solar for Oregon Communities listening sessions in Roseburg, Redmond, Hood River and Portland in 2017 to gather input and ideas about ways to reach and serve more customers with solar. The workshops also received support from Oregon Department of Energy, Spark Northwest, Sustainable Northwest and the U.S. Department of Energy Solar Energy Technologies Office. Community Energy Project, which provides community education in weatherization and lead poisoning prevention, as well as direct weatherization and repairs, for low-income seniors and people with disabilities across Multnomah County. Constructing Hope, a pre-apprenticeship training program located in Portland that helps students from justice-involved backgrounds and low-income communities develop an understanding of apprenticeship opportunities in the construction trades. 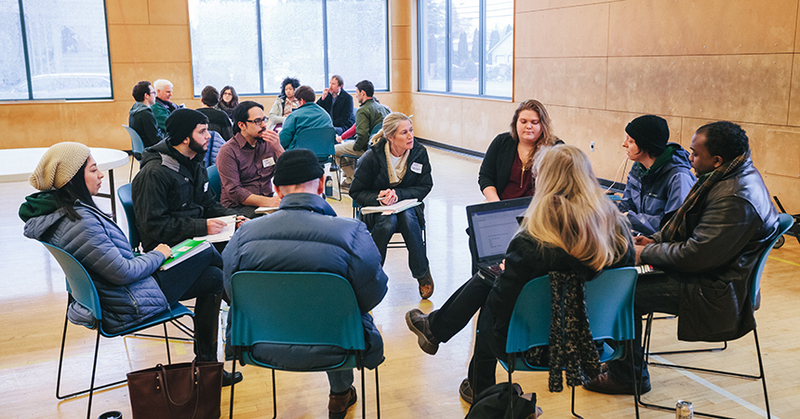 Douglas County Smart Energy, a coalition of utility partners, nonprofit experts, and business and community members that works collaboratively to promote awareness and expand opportunities around clean energy in Douglas County. Native American Youth and Family Center, a cultural community center that offers wrap-around services from economic development to youth and educational services that are deeply rooted in Native American values. REACH Community Development, which believes that everyone in the community deserves an affordable place to call home. As a nonprofit affordable housing developer, REACH incorporates green building practices that make their buildings healthier and more affordable for residents. Verde, which serves communities by building environmental wealth through social enterprise, outreach and advocacy. Verde repositions sustainability as an anti-poverty, anti-displacement solution that can provide multiple benefits—education, employment and health—to low-income communities and communities of color. 350Deschutes, a nonprofit organization and part of the 350.org global network that organizes vulnerable Central Oregon communities to take action toward a just climate transition through outreach, educational opportunities and an annual conference. Based on the listening sessions, 30 in-person interviews with organizations that serve low- and moderate-income customers, research and the monthly low- and moderate-income solar work group discussions, Energy Trust identified a list of program, structural, financial and policy barriers to low-income solar access. Barriers include upfront costs, competing priorities in lower-income households, low awareness and understanding of solar benefits, lack of tailored marketing and appropriate messaging, access to capital or financing, building characteristics and limitations for renters. The work group also outlined a set of three high-level strategies to address these barriers, with plans for implementation in the next two years. Strategies are to build the capacity of nonprofit and housing agencies to develop solar projects, support the development of effective and replicable funding models for low- and moderate-income solar projects, and help Oregon’s community solar program overcome barriers to low- and moderate-income participation. In the remainder of 2018, Energy Trust and members of the low- and moderate-income solar work group will expand this effort through a new series of work group meetings and a solicitation for low- and moderate-income solar project partnerships. In 2019, selected solar projects will move forward, and case studies will be published to disseminate best practices in other communities and support deployment of solar for more customers across Oregon. For more information about the low- to moderate income solar work group, meeting materials and strategy document, please visit www.lmisolaroregon.wordpress.com.